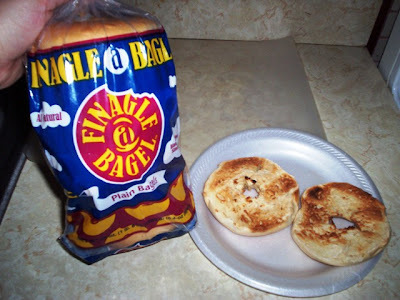 I have been dying to try a Finagle bagel (lol) ever since their commercials started airing locally. They have several locations around the Boston area, but that's an hour or so away for us. It's kinda far to go for a bagel. Then I heard that some retail outlets were carrying them frozen in packs of six. Even though I'd have preferred to get them from one of their store sites, I'd settle for the frozen. So when Laura spotted them in our local Stop & Shop freezer you know they got tossed right into our carriage. This pack of six cost us $3.69. THE VERDICT: These bagels are great! They are bigger than most of the little frozen hockey pucks you usually find. Plus when they're toasted, they maintain a very soft, fresh, and chewy inside, just like you'd find in a real bagel shop. We bought the plain bagels but they come in several varieties like cinnamon raisin, sesame, whole wheat, egg, and onion. There are even more choices in their shops. The bagels have 290 calories each but they're a big bagel and could easily be shared. So if you love bagels (and who doesn't) and you see these in your favorite retail store, pick up a package. I know you'll be happy you did. I was. 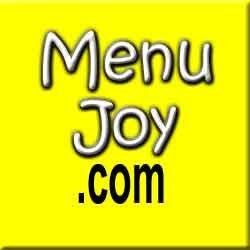 Check out our friends at MenuJoy.com for area restaurant menus.